Add new API baselines to your workspace. Edit an existing API baseline. The wizard can be used from the Plug-in Development > API Baselines preference page preference page, by selecting either the Add Baseline... button (to add a new baseline) or the Edit... button (to edit an existing baseline). Browse... Selecting the Browse button will allow you to browse for the location of an Eclipse SDK installation. Reset Selecting the Reset button will re-scan the specified location and recreate the API baseline. 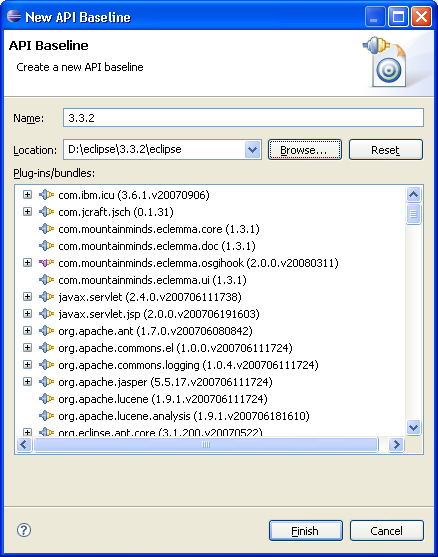 The API Baseline wizard, showing an example Eclipse 3.3.2 baseline being created.